One thing you can count on is having to clean your chimney or having someone clean it for you. This chimney cleaning brush is a must no matter who does the cleaning. This Professional's Choice round brush is 5 inches in diameter touch poly bristles that are made to resist acid damage and withstand rough professional use. This brush has a single-spiral spindle design with a heavy-duty plated 3/8 inch thread double-swaged fitting and has .075 poly filaments and 7 inches of fill. In chimney cleaning brush language that equals toughness. 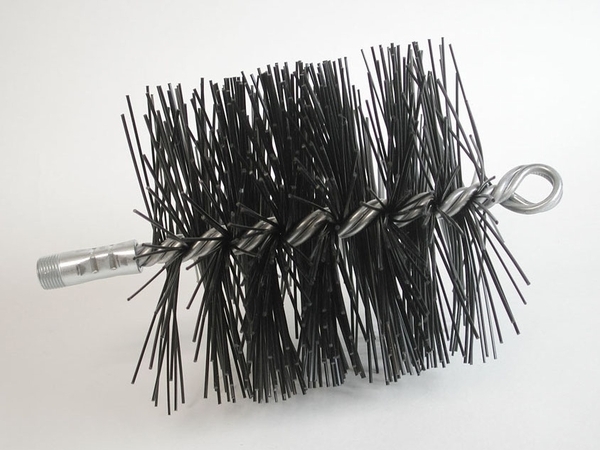 You can count on this brush o remove soot from coal, oil and gas flues. Made by Rutland, your chimney doesn't stand a chance of staying dirty once it meets this found poly chimney brush. Does "poly" bristles mean non-metal? Are the bristles like hard plastic? You are correct. The bristles on this brush are manufactured out of polypropylene, which is a durable and somewhat stiff plastic.